LIMITED EDITION MOLESKINE NOTEBOOKS: The classic Moleskine you love with a cover that reflects your favorite books, movies & games, including Star Wars, Dr. Seuss, Pokémon, Barbie, Alice in Wonderland, Batman, Harry Potter, Super Mario & Transformers. DELUXE QUALITY PAGES: Moleskine's thick, ivory paper pages in a hardcover Moleskine notebook, softcover Moleskine notebook, cahier or volant journal, or Moleskine planner are perfectly textured for writing with a ballpoint pen, fountain pen, or pencil. MOLESKINE IS LOVED FOR A REASON: Writers, students, artists, professionals & travelers love Moleskine notebooks & planners. From lined to unlined, dotted to graph paper there's a Moleskine notebook for your needs. Try one & you'll understand the passion. 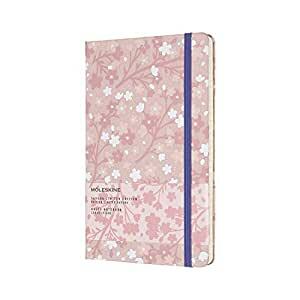 Enjoy the exquisite yet ephemeral beauty of Japanese cherry blossom all year round with the Sakura Limited Edition Notebooks. Each tactile silk cover features a delicate pink and white floral print that continues on the endpapers inside, as well as a set of themed stickers that allow you to scatter blooms wherever you choose. Sakura has long symbolized springtime re-birth, as well as the fragile and transitory nature of all things. The Moleskine Sakura Collection captures this moment celebrated across Japan by locals and visitors alike, providing you with space to transform fleeting ideas and inspiration into long-lasting projects, plans and stories.